The sound of gunfire filled the air as hidden Japanese soldiers continued to rain death on the Marines who struggled to reclaim the small island of Guam in the Pacific Ocean. From the first American landings in July, through the summer and fall leading up to Thanksgiving, some of the Marine Corps rifle companies suffered 50 to 75 percent casualty rates. Carl L. Sitter, a 22-year-old officer from Pueblo, Colorado pushed his young Marines forward, encouraging them to meet the enemy and defeat them. He shouted encouragement, pushed them from position to position, ducking only when needing immediate cover from some new threat. A new burst of enemy gunfire drove him to the ground. Pinned down for the moment, he would not allow his Marines to stay pinned down for any length of time. That would be fatal for all of them. Shouting orders, he rose from his position to attack the enemy. As quickly as he had risen, he was driven back to the ground by a horrible blow to the chest. In that millisecond between the moment when the fatal bullet arrives and the conscious mind records its last impulse, he knew he had been shot in the heart. There was a moment when all was numb...then the young officer realized that he was still breathing...still conscious of the gunfire around him. Instinctively he reached his hand to his chest, felt the ragged edges of his uniform and the warm flow of blood. And cold, hard, shattered steel. Too much steel for a single bullet. Slowly Lieutenant Sitter's mind began to clear, and he came to an amazing realization. The torn, cold steel he felt was the shattered remnants of the .45 caliber pistol holstered below his left shoulder. It had taken the direct impact of the enemy round and saved his life. Surging to his feet with a yell, he began the attack anew. This time the enemy rounds hit the soft flesh of his shoulder. Though painful, the wounds were not fatal. World War II Marine Corps Lieutenant Carl L. Sitter would live to receive his Purple Heart Medal, as well as the Silver Star that would also be awarded for his heroic leadership that day. He would also live to face even greater tests of his courage and leadership in years...and wars... to come. Carl Sitter was 100% Marine! Carl Sitter was a Man of War! Sitting with quiet humility on a wooden pew in Watts Chapel at Union Theological Seminary and Presbyterian School of Christian Education is a man of peace, a student of the Scriptures. Next to his heart he holds a Bible, worn from hours of study. Mid-term finals are finally done, and with a whispered prayer he says, "Lord, if I can make it through one more semester, I'll have it made." For years now this student has struggled through daily classes, fought to maintain his grades, and cleaved to the dream of ministering peace to others. In many respects he is not at all unlike the other seminary students, struggling with class work, meeting in study groups, worrying about his performance on the next test, and looking forward to graduation. A closer look at the aspiring minister, however, reflects many differences between the man and his fellow students. The wrinkles in his face reflect the character of a man who has been to hell and back. The hair is grayer, the posture a little more stooped, the demeanor more that of a kindly old grandfather than a giddy, young college student. But one look in his eyes reveals the soul of the man, a man who deeply loves God, cares about others, and desires with all that is within him to serve others. Thus one can finally conclude, this man really isn't any different than the idealistic young people with whom he attends class. Slowly one's eyes are drawn from the Scriptures over his heart, to the small pin on his lapel. The blue, six-sided cloth pin bears the likeness of several small stars... and then recognition dawns. This man of God wears our Nation's highest award for military valor...the Medal of Honor. Carl Sitter is a Man of God! Carl Sitter is a Man of Peace!!! One is left then to ask, what could have effected such a change the this man's life...from man of war to man of peace, from leader of Marines to gentle "shepherd"? Only when you came to know Carl Sitter did you begin to realize, there was no change. In both roles, he was the same great man, doing what the moment and situation demanded. And it was his strength of character that motivated him in both. That character came from two great lessons, the need for strength from someone greater than himself that he learned from his grandfather, and the importance of protecting the heart that he learned at Guam. As a teen, Carl Sitter was tough...not mean...just a kid who developed a character as strong and hard as the steel his father smelted every day. By his own admission, he didn't think much about God, certainly not becoming a minister. In fact, it was the Marine Corps that challenged and beckoned the new graduate like a seductress. "It was," he said, "the first of my three careers." It was that career that took him to the "brink of Hell" and taught him the importance of God. Carl's grandfather was a Presbyterian minister, and Carl had grown up in church...only to drift away for a time. As a young officer and leader of Marines in combat, the lessons of those early days in Church and the words of his grandfather began to take on a new importance. In the Pacific, Lieutenant Sitter found himself leading other young men into battle, their lives under his command. "That's when I started getting close to God," he recently said in an interview for his hometown newspaper. It was also when he learned the importance of protecting the heart, for it was the pistol covering his heart that saved his life at Guam. His faith...and his .45...enabled him to return home to build a life with his wife in Pueblo. Six years later, Captain Carl Sitter returned to "Hell", only this time "hell froze over." On the frigid road to the Chosin Reservoir in North Korea, Captain Sitter faced the greatest challenges of his life to date. During his most trying hours, Carl Sitter remembered the importance of his personal faith. He also remembered the importance of protecting the heart. Throughout his entire tour of duty in Korea, Captain Carl Sitter always wore a .45 caliber pistol holstered over his left shoulder. It was no "John Wayne" gesture, it was the result of a lesson learned earlier at Guam when such a pistol had saved his life. 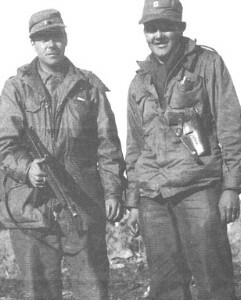 The battle at the Chosin Reservoir of North Korea in the days following Thanksgiving Day, 1950 was one of the most bitter and difficult trials in American history. Captain Sitter and his fellow Marines faced the coldest winter in a century, surrounded by a well supplied Chinese Communist force that outnumbered them more than 10 to 1. Through it all, Captain Sitter held his force of young Marines together and taught them to fight, and survive, with pride. During two of their darkest days, one young Marine observed the helplessness of the company's situation and ask, "What are we going to do?" "What are you gonna do?" Captain Sitter growled. "You're gonna fight, damn it! You gotta fight or we aren't getting out of here. It's that simple." Stephen Olmstead, who would eventually rise to the rank of Lieutenant General, was a young private under Captain Sitter's command. "Carl Sitter was just one hell of an inspiration to us at a time when we were really in big trouble," he said. "His skills, his leadership and his inspiration are the reasons that a lot of us are still alive today." 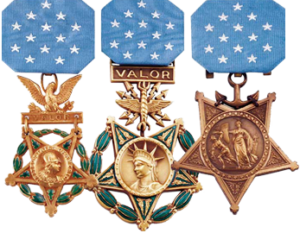 Two days of intense fighting on East Hill outside of Hagru-ri are cited in the citation for Carl Sitter's Medal of Honor. Those two days reflected only a portion of the week of hell Captain Sitter and his company survived. And when the job was done, Captain Sitter, wounded repeatedly, led his battered company back out of the Chosin Reservoir. In all, he would wear four Purple Hearts, as well as the ever-present pistol to protect his own heart. More than thirty years in the Corps, then a "second career" in the Virginia Department of Social Services should have been enough to convince any man that he had done his "fair share" of duty for God, Country and fellow man. Carl Sitter retired in 1985 at the age of 63, but Carl Sitter was simply retiring from his second career...not from his life of service. Never forgotten were the lessons he had learned as a boy from his minister grandfather, or the importance he placed upon protecting the heart. Carl Sitter chose to replace the worn leather holster of a .45 caliber pistol, with a leather-bound copy of God's Word. After years of lay-ministry in his home church at Shady Grove United Methodist Church, Carl Sitter determined to return to college. And so he did, in 1998 at the age of 75. Carl graduated from college at age 77. "War doesn't accomplish what it sets out to do. What it does is destroy people on both sides, and it takes many years to get back what we destroyed. We don't really win anything by war." "I'm a realist. I have a view of war as a last resort." "I guess that's why I'm going back to school, to learn more about the Lord and to use that knowledge to help all people. God says we're to love everybody." There is something quite humbling in sharing such special moments with a man the stature of Carl Sitter, but Carl Sitter was that way with everyone he met. Like so many of those great men who wear the Medal of Honor, he was a man who never took himself or his "hero" status too seriously but was always concerned with the needs of others. Never pretentious, his pastor the Reverend Burt Brooks recounts how Carl Sitter showed up rather sheepishly for Church one Sunday to ask if it were possible for the pastor to arrange a substitute teacher for his Tuesday night Bible Class. The White House had invited him to dinner. "He said it in such a humble way, not presumptuous way," says his pastor. "I told him I thought it would be alright." Carl Sitter was never one to miss any kind of personal commitment, but with that permission, Carl Sitter missed class to spend time with the President.